Patxi Atozki first worked as a skilled wood craftsman in Pamplona with wood carver Javier Fernández. 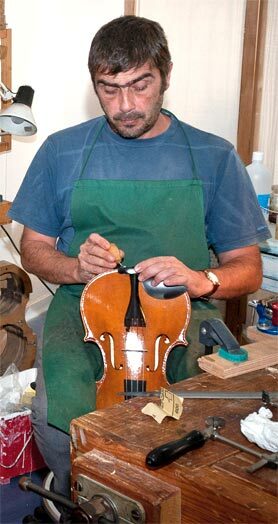 Later in 1989, he started violin-making at the Juan Crisóstomo de Arriaga Conservatory in Bilbao. There he was trained in applied acoustics for the violin by Doctor Jesús Alonso Moral, a PhD in acoustics from the KTH Royal Institute of Technology in Stockholm. In 1991, wishing to study the construction and varnishing in further depth, Patxi was invited by Pierangelo Balzarini, violin-maker and winner of the Antonio Stradivari International Luthiers Competition, to his workshop in Cremona. There he worked alongside Eduard Wemelsfelder and Favio Volta, and they all greatly benefitted from working together. In 1993, at the first Pablo Sarasate International Violin Competition, Patxi had the opportunity to adjust the Vuillaume violin that once belonged to Pablo Sarasate violin. It was with this violin that Ruggiero Ricci gave his magnificent closing concert. Thanks to the many other violin-makers that Patxi had the opportunity to know and to the numerous courses and conventions he attended, he broadened his knowledge of materials and perfected his work. In 1992, Patxi established his workshop in Pamplona and devoted himself to producing and restoring the quartet of stringed instruments.